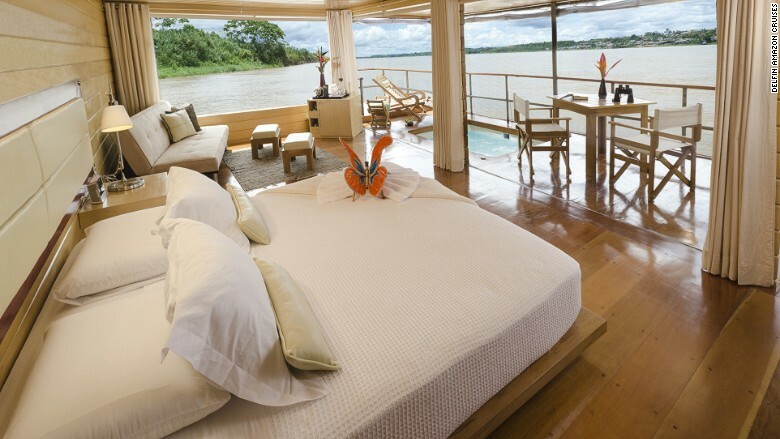 Glide down the Amazon on an intimate river cruise with a few of your closest friends. The Delfin 1 vessel has only four cabins that can hold up to 12 passengers, but eight is ideal, said Ines Orihuela Vallejos, promotion and sales assistant director at Delfin Amazon Cruises. The four-night trip on the 67-foot long boat launches in Nauta where the Maranon and Ucayali Rivers meet to form the Amazon. The boat has a roughly 1:1 passenger to crew member ratio. Peruvian cuisine is showcased on board with native fruits, vegetables, spices and fish. Table décor changes nightly on each trip to showcase handmade designs from local villages. Each day includes different excursions including swimming with dolphins, treetop canopy walks, visits to local communities and fishing for piranhas. Travelers can also go out on paddleboards and kayaks and there's on-board music and entertainment offerings. Animal sightings are common, and early-morning bird watching is a highlight. "It's pretty impressive to hear all the birds waking up with the beautiful sunrises," said Orihuela Vallejos.